A classic American variety, and widely regarded as one of the best flavoured with a good sweet/sharp balance. A precocious and productive tree in US apple-growing regions. My favorite apple. They are available all year at Dierbergs in St. Louis. Born in the 50s I grew up on the rather short buying season for these delicious apple. They are hard to find these days and they don't store well, so don't stock up. I'm wondering how a side by side comparison with Jonagold would go. I think I will plant both. My mother was born and raised in Iowa, and this is the apple that she remembered fondly. I had never eaten one until today when an old man in the neighborhood identified his tree as a Jonathan. I tried one, and it was like an explosion in my mouth! Sweet ,tart and crispy. Let's bring this wonderful old apple back! In Vermont, this tree grows poorly: apples can be small and deformed, very susceptible to scab, and trees experience stunted growth. But the firm tartness of the flesh make this a rewarding Sour Patch kid for the tongue. This is my absolute favorite apple. I grew up in Iowa and these would always be in the grocery store in the fall and winter. They keep for quite a long time and have an amazing sweet/sharp taste that's a bit acidic. I'd love to try a hard cider made from these apples. They're great for snacking and for cooking, but note that they remain somewhat firm in pies and applesauces. They don't mush up like McIntoshes. If you can't find them fresh, Stouffer's sells a frozen side called "Harvest Apples" which is essentially just Jonathan apples and cinnamon. I'm in the military and always seem to end up in places that don't carry these apples. I'm all the way out in Hawaii now and they're nowhere to be found! Woe is me! I grew up in Kansas City. My parents would by a bushel of Jonathan's in the Fall and store them in the basement where they would last through the winter. My mom made the most unbelievable pies using Jonathan's. I think they are simply the best eating apples produced. Unfortunately here in the Phoenix area they haven't been available for 10 years or so. They have been replaced with Jonagolds, not the same. I have been told it's because of a longer shelf life. Too bad, I really miss them. Doesn't make any difference if they're USDA or organic or GMO!! Lol. Jonathans are the best apples ever! I can't seem to find them here where I live either. I guess they were like everything else, we liked them so well that the growers decided to stop. Sad that growers let such a good thing slip through their fingers. I don't like eating cardboard and that's what all the other varieties taste like!! For me Jonathans are what an apple should taste like, tart, crisp, and rich. My parents' Jonathan apple tree is over 30 years old, so I'm not sure how much longer it will last, but it has almost ruined me on other apple varieties. My parents had a Red Delicious, Jonathan, and Green Transparent. My mom used to make good tart applesauce from the Green Transparents, and the Red Delicious had the largest apples which were dark red and visually appealing, but if I wanted an apple to eat I picked one from the Jonathan tree. Jonathans have ruined me on other apple varieties. 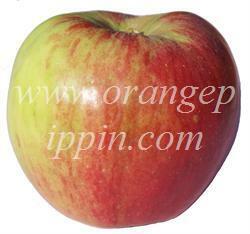 They are tart and crisp and for me other apples, especially store bought, taste bland and synthetic. Sadly, to me, I've had trouble finding Jonathan's in stores and that tree in my parent's yard, though it still produces apples is at least 30 years old. No other variety can beat the Jonathans. My mother (a child of the depression era - no one can bake like them! :) ) swore by them for her out-of-this-world pies and desserts. This apple has gotten lost in the vast plethora of awful newer varieties, in my opinion. I don't think this generation has any idea of what should constitute a great apple! They are the best for eating and baking; best flavor hands down. They are plentiful (thankfully) in Michigan's wonderful season this year - I am so happy! We have many Jonathans on our property here in U.P. Jonathan apples are the very best, but they are hard to find. My mother used to ship them to me from Indiana. I can not find Johnathan apples anywhere around me in a range of 50 miles, people tell me to try this apple or that apple and none compare with the Johnathan, they are best for eating and cooking so I gave up eating apples until I find Johnathan. Jonathan has become a difficult to find apple. Here in Maryland I have to drive up to the Mount Airy / Frederick area to buy them directly from family owned orchards. They are worth the effort! Eating one of these apples is an experience: crisp, juicy, perfect sweet/tart balance, and an explosion of "appley" flavor. The best cider in the world was once sold at the old Cider Barrel in Germantown, which is sadly now long gone. The owners once told me that they used the juice from the Jonathan apple in the mix to add depth of flavor. 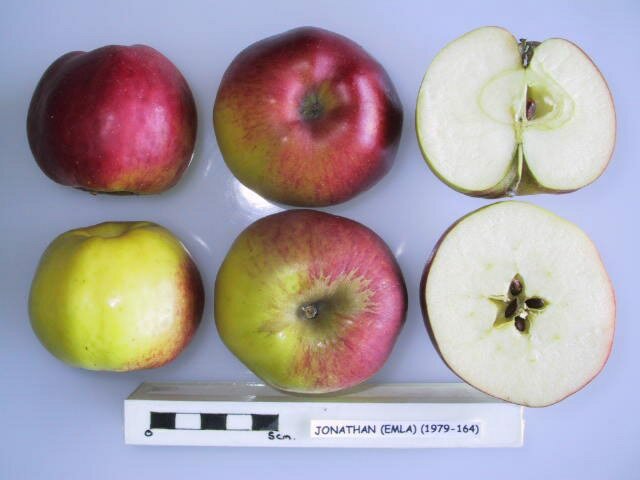 Jonathan's are also excellent cooking apples. Basically the perfect American apple. This was always my favorite apple for over 50 years, but it seems the ones sold in stores the past 10 years or so are just not up to "snuff". The old style Jonathan is hard to beat. Fuji comes close, but still not as good as the old time Jonathans were. Great apple for making caramel apples at Halloween. I wait all year for the short season for Jonathans, my favorite eating apple! Are these apples USDA organic? If I had to choose just one variety of apple, this would be the one. Short shelf life, but best flavor. I just came back from Niles, Michigan, and bought a peck of jonathan apples from Shelton Farms Market. I had bought them in Louisiana once, but they were not fresh. I'm so glad I looked for them in Michigan, where they are more often grown. They are as good as I remembered! My family grew up driving to Michigan to buy apples every fall for canning. Back in the 70's and 80's, the Jonathons we got around here (Colorado) came in right after Labor Day and were small, tart and delicious. Now they don't show up until October and are large, mushy and not very tart. My theory is that the breeders have ruined them in the quest for ever larger fruit. Occasionally you can find some organic Jonathons similar to the old fashioned ones . I really miss them. This apple was renamed "Kougyoku" when introduced into Japan. It was a standard here for a long time, until the (bland and insipid) Fuji came along. Thousands of acres of Kougyoku were ripped up and the orchards replanted with Fuji. However, it looks as though the Kougyoku is staging a comeback. Many older customers are now searching for this variety as, in agreement with the other comments above, they recall it as having had a superior flavour both as an eater and as a cooker. Many orchards are starting to restock and M9, virus-free seedlings are now widely available. And yes, it's a rollicking good apple! Just had my first taste of one from the E.L. Sylvia Farm of Dighton, MA (they come to the Stoneham Farmer's market). A wonderful discovery! I agree with this person.Jonathan apples were,are the best!But where do you buy them?I grew up in Washington State where ALL those were grown,and have family still there,and THEY can't find them either.Where can I buy them from a packer? In the '40s and '50s, Mom used to buy Jonathan apples for us, even 'way down here on the Texas Gulf Coast, south of Houston. They were our favorites. But I haven't seen them in the stores for years. They're still my favorites. Jonagold and Honeycrisp are good, but not nearly as good as Jonathan. I know I'd eat a lot more apples if Jonathans were available at the local markets. I need a source to buy Jonathans; anyone? If you can get to Langhorne Pa. find Styers orchard. They allow you to 'pick your own' and that includes Jonathan apples. Thee apples are so sweet/tart and must be eaten with a napkin, to catch the juice. The family sold out the store a few years back, and you must drive behind the store to get to the pick your own spot. Well worth the trip. We are growing one of these on our property. It has a grafted branch of granny smith apples and a local expert tells us this is required for the Jonathon to be more productive. The Jonathan is my favorite apple for baking. In my opinion it makes the most flavorful and delicious apple pie possible. It has the perfect sweet/tart flavor for pie and any baked apple dessert. Sadly, in recent years it has become harder and harder to find around here. It only seems to be available for a short time in the fall and even then is hard to find. We are grateful to Brogdale Farm - home of the UK National Fruit Collection - for providing samples of this variety. Lady Williams - Jonathan has been suggested as a possible parent of Lady Williams. Rated as highly susceptible - control always needed where CAR is prevalent.